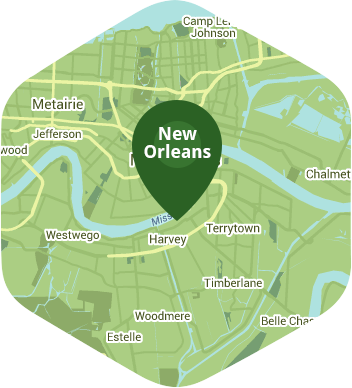 Book a skilled lawn pro in Chalmette. Backed by a total satisfaction guarantee and amazing customer support. The lovely community of Chalmette has weathered wars and storms and continues to rise like a phoenix, unbroken and unbowed, and ready for new opportunities. As a resident of Chalmette, you take pride in your resilient and storied community, and pride in your own property, taking pains to bring out the best in both. Lawn Love is here to help you get the lawn of your dreams, easily. With just the click of a mouse or a tap on your phone, our independent lawn care experts can be on their way to handle all of your lawn care chores, from routine mowing to intense cleanup, and everything in between. It's never been easier or more convenient to get a perfect, property-enhancing green lawn. So call Lawn Love today at 504-437-1838 or try out our convenient two-minute quote, and let Lawn Love give you the lawn you've always wanted, the easy way! Rated 4.79 / 5 stars in 1,184 Chalmette customer reviews. Here are some average lawn care prices for homes in Chalmette. Average lawn size 3,504 sq. ft.